All of the episodes will deal with domestic violence. Continuing with the Administration’s efforts to stop domestic violence and sexual assault, Vice President Joe Biden will appear in PSAs alongside Mariska Hargitay, aka Det. Olivia Benson on Law & Order: SVU, airing during a marathon of that show on the USA Network this Sunday. The 14-hour marathon is part of the recognition of October’s National Domestic Violence Awareness month, presented in partnership with Hargitay’s Joyful Heart Foundation and the No More Foundation and highlighting the White House’s 1Is2Many campaign. “Society continues to misplace blame and shame on survivors — both women and men. That has to end. 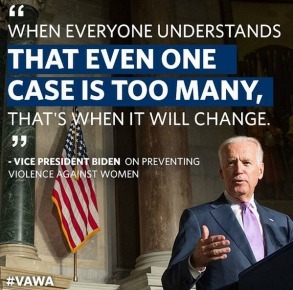 I am so profoundly grateful to the vice president, who continues to use his voice — and office — to speak boldly about these issues and stand up for survivors,” said Hargitay in a statement. The episodes that are airing will focus on domestic violence and alleviating the stigma related to it. The “No More Excuses” marathon event will start at 9am ET and air throughout the day.